It takes a lot of energy to stop yourself from following a distraction. Yet it’s better to stop yourself early, quickly, and often before the distraction takes over. For example, when you’ve decided to concentrate on a task, turn off your email alert so that you’re not seduced into looking at it even for a few seconds. Once you look at the email, your attention has already shifted away from your more important task and, before you know it, you’re reading the email. Now it is going to take a bigger effort to get back to your task and re-orient your thinking. To get more power from your brain, reduce any external distractors. Practice stopping yourself from being distracted by both external and internal sources. It will be a struggle at first, but as you get better at it you will increase your effectiveness. 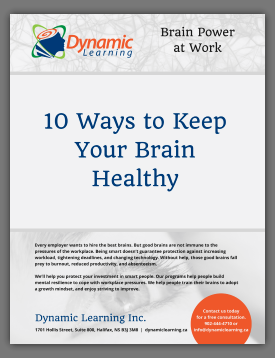 The more you work at concentrating, the more neurons, dendrites, and pathways will be formed. You do have the ability to avoid being distracted, but remember that thoughts can stray into your spotlight at any time, crowding out more important concerns. Every hour at work, you can practice bringing your attention back to what you want to concentrate on. Every time you do that, your neurons, stimulated by that effort, will fire more rapidly. Be aware that when you’re tired, hungry, or anxious, it’s harder to resist distractions and easier to make mistakes. To avoid fatigue, eat a good breakfast every morning, make sure you eat well in the middle of the day, and between tasks take breaks to exercise and stretch.